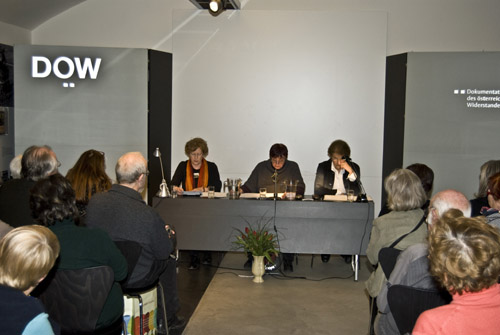 was founded in 1963 by former members of the Austrian Resistance, victims of NS-persecution, and committed scholars from the sciences and humanities. The centre's initiator and its scientific director until 1983 was Herbert Steiner, who had returned from exile in Great Britain. From the very beginning the centre had a nonpartisan and pluralist orientation: the Communist, Socialist, and Catholic-Conservative associations for the victims of Fascism, the Catholic Church, the Jewish community, representatives of the Roma and Sinti, and politicians sat on its executive board. Collecting and archiving relevant source material and its scientific evaluation; publications. Managing archive and library; advising or supervising students, pupils, journalists, and other visitors. Managing the highly valuable Oral History-collection (2800 tapes from more than 1000 interviews) and the extensive databases created in recent years (Austrian victims of the Holocaust, political victims of Nazism, those persecuted by the Gestapo and the Nazi justice system, Austrian anti-Fascists in the Spanish Civil War, etc.). Informing the younger generation and adults about the crimes of National Socialism by compiling teaching material for schools, organizing groups to visit the DÖW and its permanent exhibition, providing victims of Nazism with opportunities to talk in schools, offering courses at university, etc. Updating the centre's homepage with details of events, the presentation of projects and their findings, book reviews, current news on the extreme right-wing scene; servicing the databases mentioned above.